A wedding is one of the most if not the most important day in a woman's life. Making the special day filled with the bride's personal style takes top priority. 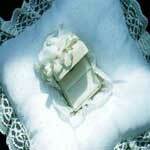 By browsing the patterns found below you will find a selection of ring bearer pillows. 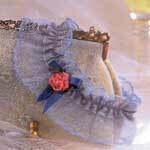 a Victorian handbag, a simple but elegant garter and more. From simple to more sophisticated, you can easily create a beautiful and stylish wedding by sewing some of the items yourself. 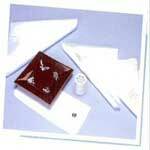 Wedding items are generally handed down to family and friends making homemade items even more heartfelt. Create a wedding that will always be remembered for its beauty and uniqueness by turning dreams into reality with wedding items you have sewn. What a great way to add even more meaning to this charming tradition. This ring pillow eliminates the need to fuss with tying and untying ribbons. 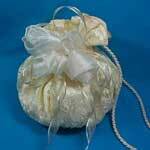 Satin and lace make this a beautiful bag that any bride would be proud of. The following instructions are for a veil attached to a comb. 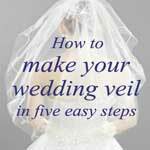 In most cases veils are easy and inexpensive to make. For a bride on a budget making a simple wedding veil is very easy and requires only a few steps. A small chic handbag can add a touch of class to any wedding ensemble. This project requires little sewing skills and looks quite graceful. A single layer wedding veil is extremely simple to make & here are instructions to get you started. 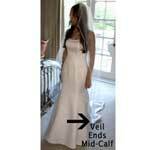 Your own veil isn’t really difficult and it is certainly far less expensive than buying one. 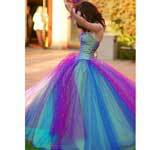 A prom dress can be turned into a daring multicolored wedding dress. Making a garter is a fun and easy project, just follow these complete instructions. Here is an easy garter project you can make in just a few minutes for the bride. Match the color of the bridesmaids’ dresses, or add colored ribbon accents by making your own.